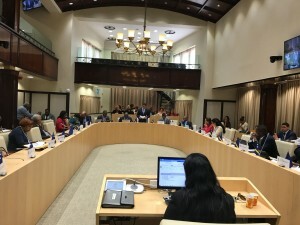 WILLEMSTAD - In parliament, there is a call for the Minister of General Affairs, Eugene Rhuggenaath to give a more detailed explanation of the case of Roderick van Kwartel, Director of the public company Curaçao Refinery (RdK). After all, Rhuggenaath has been aware of the case for some time. Van Kwartel and two other employees of the RdK are obliged to take a holiday. The reason for this is an internal investigation that is taking place in connection with the bidding process for the operation of the refinery. Meanwhile, it is common knowledge that allegations have been made by third parties in connection with possible strategic partners for the operation of the refinery. These are serious accusations and therefore there is a reason for an investigation. That must confirm the accusations or clear the names of the people involved. Pending this research, Van Kwartel and the two other employees, top officials are currently home. Opposition party MFK has already asked for an emergency meeting. The MAN faction also wants clarification about it.